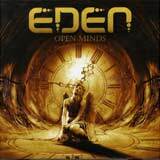 Eden is a newly formed English band playing classic heavy metal, with some elements of hard rock mixed in, very much how TNT have managed to do over the years. The style is grounded in old school 1980's heavy rock and metal, with a dash of classic 70's rock. Guitarist Vince O'Regan and Kick vocalist formed the band, with Open Minds being their debut. O'Reagan is quite a workhorse. In addition to Eden, he wrote and produced Bob Catley's latest studio album. He also has another band called Alibi that is realizing their debut album on Escape Music this year. Having worked with Bob Catley, it may lead you to believe that this album is slick sounding slab of melodic rock dashed with a generous splash of keyboards. Eden certainly branches out in a different direction than that. This album is back to basics, gritty rock / metal driven by heavy riffs, catchy melodies, and soaring vocals of Nick Workman. The sound is raw, especially in the percussion department which is tinny, but not to the degree that detracts from the listening experience. Actually, I find the sonics mostly good considering the attitude and style of music at hand. However, I think the guitars don't come across nearly as meaty as they are being played. The songs could have had a much bigger umph. So, I'm not quite sold on the production, but it doesn't detract from the experience. Each of the songs features memorable, but not overbearing melodies and chorus lines. I don't think you'll necessarily be singing any of these songs in addictive fashion after the first listen, but the songs will definitely find their way into your memory after a few spins. There's more to the music here than catchy chorus lines and melodies. The forefront of the sound is most certainly the riff busy guitars. The rhythm section is superb, giving the album songs a substantial bottom end and heavy edge. Furthermore, a nice dose of dual guitar shreds sprinkle the songs in just the right moments. Eden also changes up the pace quite frequently from song to keep the listener's attention. No two songs sound the same, and you really need to give this album your full attention over several listens to appreciate all that is going on musically. Heads Up, for example, displays some of the best guitar work on the album. The lone ballad of the album Fools Parade is one of the few ballads that doesn't get the skip treatment from me. A classic power ballad all the way, the passion of Workman's vocals coupled with the memorable guitars and infectious songwriting form the perfect recipe. Some spots of the album, such as the intense Erase & Rewind feature some distorted vocals that totally sound out of place. I would be much happier if Eden were to lose this element in the future. Aside from these small complaints, I have to say that I am pleased with each of the songs offered on Open Minds, especially the more I listen to it. Open Minds is a very impressive debut album from some accomplished veterans of the scene. This isn't the type of album that will jump on you after the first listen, but that's not to say that it doesn't have lasting power. The interesting and diverse song writing coupled with the hard edged and well played guitar work of O'Regan make the songs very worthwhile. Workman's passionate and soaring vocals provide the personal touch for this album. While the music may take a few spins to absorb, I feel that the vocal performance provides the listener with something to latch onto instantly while the rest of the music sinks in. While this band seems like sort of a "project" collaboration between O'Regan and Workman, I'd like to see them continue on as a band.